On the 30th of September the Nordic Resistance Movement (NRM) will try to march through Gothenburg. Their march is staged at the same time as the biggest book fair in the Nordic countries, attracting about 100 000 participants. This is a call for Nordic participation in the antifascist protests and to a radical left book fair during the weekend. 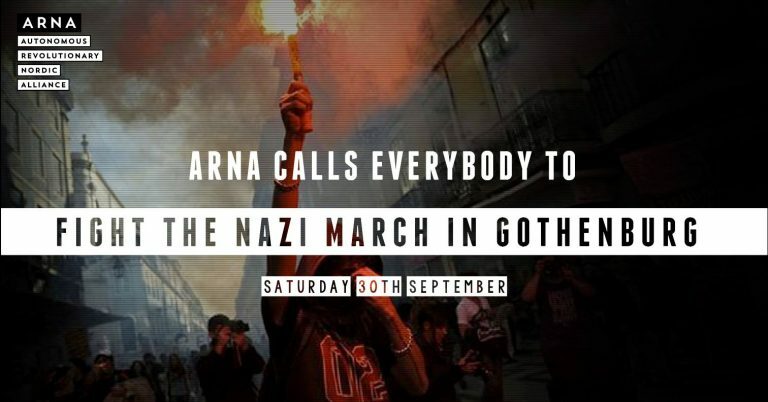 On the 30th of September the Nordic Resistance Movement (NRM) will try to march through Gothenburg. Their march is staged at the same time as the biggest book fair in the Nordic countries, attracting about 100 000 participants. This is a call for Nordic participation in the antifascist protests and a radical left book fair during this weekend. NRM is an organization formed by neo-Nazi murderers and bank robbers from the 90’s, and although they are attempting to go mainstream, they are still continuing their proud tradition of being Hitlerist murderers. Today they are the largest and in practice only nation-wide Nazi organization in Sweden, with branches in Norway and Finland as well. NRM members in the last few years have murdered several people, they routinely attack left-wing spaces and demonstrations. In Gothenburg two of their members were recently convicted for eight and five years respectively, for bombing asylum centers and the left radical book shop Syndikalistiskt Forum. Where NRM does not have a Nordic presence they attempt to establish one (as in Denmark) or broaden their existing base (as in Norway and Finland). Thus, NRM is a problem for everyone living in the Nordic countries. At the same time NRM is not an aberration but rather the tip of the ice berg of a fascist development in the Nordic societies, connected to a greater reactionary and counterrevolutionary development that spans the globe from the US to Turkey. Capitalism and patriarchy is still in crisis and we must see counterrevolutionary organising as attempts to consolidate patriarchal and capitalist power over working class people, LGBTQIA+ folks, racialized groups, migrants and any others who disagree with their politics. It is clear that there is a fascist division of labor, Nazis kill and commit arson while racist politicians in parties such as the Sweden Democrats, True Finns, Fremskrittspartiet and Dansk Folkeparti push racist discourse and racist Internet warriors stir up hatred. In these times of fascist internationalism, we must counter them with our own international solidarity and fight them in all countries and all guises in which they appear. That’s why we are calling for an international and internationalist mobilization to Gotenburg to stand up against the Nazis. Buses from several cities and countries are already planed, but we need you! Fascists have managed to ‘weaponize’ the term freedom of speech, in itself a liberal legal term, and are now pushing the envelope. Where racist parties were once anathema in Nordic societies they have managed to create a space which has confused liberals who are not equipped to have their own terms used against them. The huge debate in the Swedish public around the book fair which has accepted Nazi publishing houses is just one example of this with NRM trying to get as much publicity as possible. This is evidence of how how politically bankrupt liberalism is. We oppose fascism because they are a danger to our class organization, to our spaces (like the situation in Gothenburg shows) and even to our lives (like the terrible murder in Helsinki and more recently in Charlottesville has shown once again). We take to the streets not just to fight fascism but to unmask the contradictions within capitalist liberal ideology. The march in Gothenburg is the culmination of a fascist street presence which grows ever bolder. If we do not turn the tide of such mobilizations, history teaches us that things will only get worse. Of course this is connected to other practices such as feminist struggles, migrant activism, antiracism, workplace militance, activism in social centers, etc. We do not fight fascism to safeguard bourgeoisie democracy but as part of a revolutionary struggle, for societies without classes, nations and borders, ones that are free from patriarchy and racism. Everyone to Gothenburg! Smash fascism, fight capitalism! AFA [antifa] #Gothenburg: Wide and Popular Anti-Fascism Stopped the Nazis | Enough is Enough!